Manufacturers are taking measures to upgrade their equipment as competition heats up in the crushing and screening industry. A report on the solutions being developed by several manufacturers. Demand by crushing plant owners looking to reduce their cost of operation and yield higher productivity from their equipment is driving manufacturers to make design and engineering improvisations in their products, which will enable faster installation, higher production, and bring costs down. Puzzolana Machinery Fabricators has been carrying out improvisations on the metallurgy of the wear parts produced at its in-house foundries to improve product life and reduce cost/ton of production. Due to restriction in the movement of wheeled plants, it is now supplying most of its plants based on skid design so that the equipment and structures can be transported separately, cutting down on the number of trailers required. Puzzolana has recently introduced a 450-tph crusher of 22-mm products utilizing single line operation. It has also come up with a PCC 33150 cone crusher for secondary application of (-) 500-tph capacity. “For commercial plants, we always recommend and provide stockpiles between primary jaw crusher station and secondary cone crusher station. This has several advantages: the primary crusher can be operated independently, and depending on the mining feed, the plant owner can create a stockpile. With this arrangement, the secondary and tertiary plants’ operation can be continuous, irrespective of the volumes of the mining feed, breakdowns or feed restrictions. Added advantages are reduced consumption of power, plant optimization, and flexibility in maintenance since both the plants are independent. Rationalized utilization of the rigid dump trucks for feeding the boulders and loading the finished products can also be ensured through this design arrangement,” informs Abhijeet Pai. Puzzolana has been carrying out engineering augmentation to increase production efficiency, reliability and ease of maintenance and service of its tracked plants. Our plant has the flexibility to use diesel and electric power, as required. This ensures rational fuel utilization for associated equipment like excavators and tipper trucks. It has also modified the crawler screen with a modified hopper for separation of over-sized materials for higher productivity. Puzzolana crawler units are working for the greenfield Navi Mumbai airport project, and have also been supplied to Municipal projects for recycling of plastic materials. 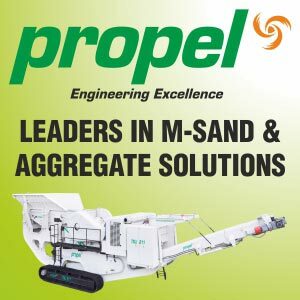 Coimbatore based Propel Industries has introduced its new PFS 955, PFS 1161, PFS 1365 and PFS 1680 Feeder screens that can take feed sizes of 560-750-900 and 1200 mm. Managing Director V. Senthil Kumar informs that the feeder screens are a combination of a feeder and a grizzly screen. The feeder screen can significantly improve the total throughput of the primary station as it can keep a primary crusher fully fed, even during varying feed conditions. The feeders are equipped with unbalanced electric vibro motor drive for reliability, give step-less feed adjustments, and are highly suitable for horizontal and inclined operating conditions. To ensure long life of the jaw crushers, the company made pitman and rear end with steel casting instead of fabrication. Explains Senthil Kumar, Steel casting based design makes production costlier at 110/kg as compared to fabrication of Rs.70-80 per kg, but its advantages are more. With steel castings the materials are stronger, because radius form can be obtained by adding the material at right places, further the stress relieving is better as stresses are relieved before machining. The four bearings in the machines are machined in one setting so that the alignment is maintained. Propel's new plant is equipped with fabrication including plasma and laser cutting machines for cutting steel, computerized numerical controls machining units, a paint shop and testing facility. Bearing housing of jaw crushers is done by CNC machines. Wirtgen India is innovating to bring higher productivity, reliability and flexibility in its Kleeman track-mounted screens, with application support for optimum use of the screens, jaw and cone being provided by its experts. The company is making four models of Kleeman screens of 300-500 tph at its Pune facility, and importing 200 and 250 jaw and cone units from its parent facility in Germany. Sandvik India is promoting its new CS 540, 250-300 tph cone crushers in the Indian market. The cone, launched during Conexpo 2017 (USA) for the global market, comes with a fully-automated ASRI in-built safety system, interlocking, and tramp relief system. The robust cone with improved features can crush highly abrasive rocks and also produce sand. Business line National head Ashoktaru Chattopadhyay informs that Sandvik will also be promoting its screens (like CS 86 four deck and CS 126 four deck screens etc) with superior screening media and wear protection. “The plants will be fully supported by our experts to ensure their availability and lower cost of operation,” he says. TIL offers a range of crushing & screening solutions to customers in India in alliance with its strategic technology partner, Astec. “TIL has done extensive value engineering on the original Astec designs for the range of crushers being manufactured at their Kharagpur facility,” says Ali Khan, Director, Marketing & Sales (South Asia and Africa) Astec Aggregate and Mining Group USA. “We have tested these machines in different parts of the country and are now ready to roll them out. No compromise has been made on the quality of the cone crushers, jaw crushers, and screens. Extensive marketing and promotional exercise is being worked out for launching the products across the country. Once they will be out in the market, buyers will see their advantage in terms of their robustness, reliability and lower operating and owning cost. TIL will be providing complete tailor-made solutions to customers starting from selection, financing, installation and commissioning,” he added. Khan informs that TIL has localized the necessary components to the best extent possible. TIL has a license from Astec for manufacturing good range of mineral processing equipment for use in mining, quarry, and infrastructure segments. TIL products include feeders, screens, jaw crushers, cone crushers, and vertical shaft impactors. For the jaw crushers and cone crushers, it has both a wheel-mounted, track and stationery design. He informs that Proman VSIs and VSGs are 30% more energy-efficient due to their multi-port technology, and their Ortner sand washing system uses only 1/6th the power of a normal screw washer due to its design. Marsman’s crushers with low capacity motors deliver the desired production, while reducing electricity costs. Avers managing director Ravi Varma, “Our crushing and screening equipment produce high productivity at low power with high output capacity and quality. We provide tailormade solutions to customers to suit their requirement, while suggesting various ways to lower their cost of production, based on a detailed analysis, before finalizing the machinery." For ensuring quicker set-up time, Marsman is promoting its combination plants of 100-200-300 tph, which have a combination of jaw, cone, screen and vertical shaft impactors. These uniquely designed combined crushing plants, introduced by the company a few years back, have found an encouraging response. Comments Ravi Varma, “Their best advantage is that they can be transported to the site and started without the worry of getting the civil work done. We have delivered numerous plants in India and the export market has always been our strong area.” Marsman products are being exported to the Gulf countries, Africa, Indonesia, Nepal, Sri Lanka and Bhutan, with Europe being its primary market. He informs that they are closely looking at recycling of construction waste from demolition as this is relatively unexplored in India. For this work, Marsman has developed a new skid-mounted, rubble crusher with horizontal shaft impactors, to which jaw- HSI and VSI can be added, as required. The crusher can take a feed of 400-500-900mm for generating 40-50mmof crushed materials. The company is presently producing three models of rubble crushers: RC-7000, 60 tph, RC 9000, 100 tph, and RC 3000, 70-80 tph. Marsman, which manufactures its plants completely in-house at its facilities in Vadodra and Nashik, uses special grade steel of Tata Steel and SAIL. To ensure durability of its products with less maintenance, advancements have been done in the welding to relieve stress in the weaker areas. The jaw plates are a mix of manganese and chromium, which lasts long and offer high output capacity while producing supreme quality stones. thyssenkrupp which acquired the design assets of Nawa a few years ago, plans to support the customers with wear parts sourced from its three warehouses based across four zones in the country. The company is presently offering two variants of solutions, one of its own and the other is the Nawa range of solutions with new thyssenkrupp design standards. The latter is fully branded as thyssenkrupp product. Along with advanced products and solutions, manufacturers are strengthening the support being provided to their customers. After all, retaining customers depends a lot on providing continuous and timely product support across their product’s lifecycle. “TIL believes in extending all kinds of assistance and service to our valued customers. After equipment installation, TIL’s service team stays with the customer to carry out job field activities. Service engineers are stationed close to jobsites, with key spare parts, so that they can provide timely and periodic service. Regular customer feedbacks are also taken to improve quality of service,” avers Ali Khan. Promoting sales through incorporating advancements in the crushing and screening equipment featuring quick setup times, higher productivity, and reliability is a notable initiative of the crusher manufacturers. However, creation of new business and retention of the same will depend on appropriate, vital continuous product support. This will be required to be carried through thorough engagement with the customers across the product’s lifecycle.